The home 3D printing market has gained a tremendous amount of momentum over the past few years thanks in part to consumer geared brands such as MakerBot. However, both enthusiasts and professionals alike have been hindered by the fact that they can only print in one or two block colors at a time. This is about to change with the announcement of XYZ Printing’s latest release the da Vinci Color which is the world’s first full-color desktop 3D printer. The new device differs from the other full-color solutions that came before it which required either nylon powder or multiple filaments to mix the colors needed to simulate full-color printing. A full color 3D all-in-one printer next? The da Vinci Color utilizes inkjet technology to inject color directly into the filament as it is being printed and the process can produce an almost unlimited range of colors. XYZ Printing is now able to produce better results at a fraction of the cost with spools of filament selling for $35 and the ink used to color them coming in at $65. The company’s new printer combines the color detail of inkjet printing with professional 3D printing technology to enable designers, architects and entrepreneurs to produce more advanced prototypes quickly and cost effectively. 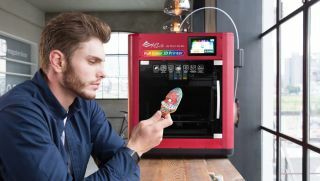 XYZ Printing’s da Vinci Color will retail for $3,000, which makes the 3D printer relatively affordable - compared to competitive solutions - for startups or hobbyists looking to add full color to their designs. The printer retails at €3 599, while the spoils cost €39 and the ink €65.